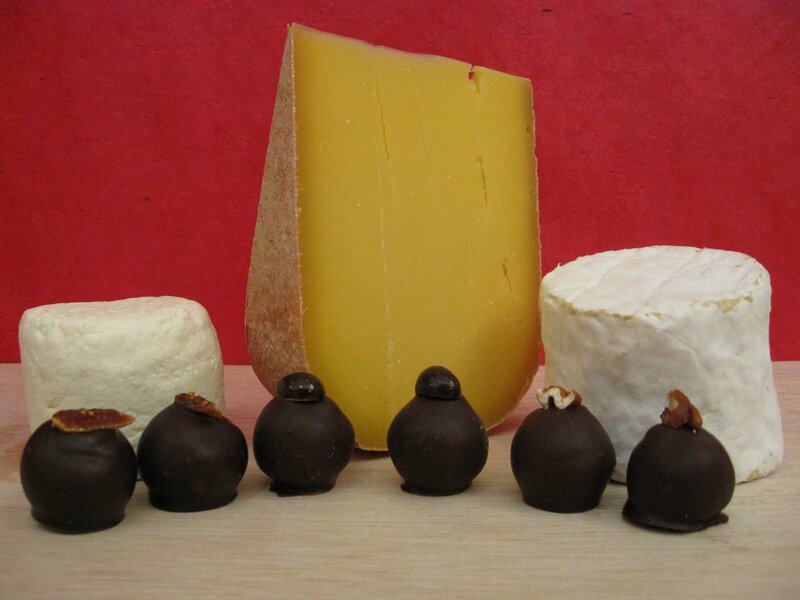 Saxelby Cheesemongers and Roni-Sue Chocolates present a Valentines’ Day Splurge for Your Sweet-and-Savory Heart! It’s that time of year again… slush is on the ground and love is in the air. This Valentine’s Day, why dally around with the usual bouquet of fresh flowers when you could get your sweetie something truly one of a kind? Saxelby Cheesemongers, purveyors of fine American farmstead cheese, and Roni-Sue’s Chocolates, makers of hand-rolled truffles, have joined forces to create a line up of cheese and chocolate pairings that are sure to make even the sturdiest hearts swoon. Saxelby Cheesemongers’ Sweet-and-Savory Heart gift selection includes three half-pound wedges of delicious cheese, as well as six hand-rolled truffles. Try some Pleasant Ridge, a deep, caramelly, nutty tomme from Wisconsin with a dark chocolate Frida truffle laced with smoky spice. Constant Bliss (an appropriate cheese for cupid if ever there was one) is a soft and buttery cheese that matches beautifully with a sweet and toasty Pecan Pie truffle. Brebis Blanche, a bright and tangy button of sheeps’ milk cheese from New York State is the perfect foil to Roni-Sue’s Portly Fig truffle, a jammy affair infused with a heady dash of port. Sweet-and-Savory Heart gift boxes are $49 (plus shipping), and can be ordered and shipped online through saxelbycheese.com or picked up at Saxelby Cheesemongers located in the Essex Street Market on Manhattan’s Lower East Side. Come on, you know your sweetheart deserves a little tlc. Tender lovin’ cheese… and chocolate. < Trains, Planes, and Cheesemobiles.